The ECG feature on the Apple Watch Series 4 could be about to land in the US, according to a new report. MacRumours has obtained supposed training documents suggesting that the ECG feature has been in beta for a few weeks, and will be added to the Apple Watch in update 5.1.2 – which will land before the end of the year. That puts the release in line with Apple’s own schedule during the September keynote. The ECG feature will land in the US to begin with, even though the electrocardiogram sensor is present in Series 4 smartwatches globally. However, while it’s been cleared by the FDA, other regulators haven’t yet approved its use. It works by two new electrode sensors, placed on the new ceramic backplate and on the digital crown. The user simply places their finger onto the crown when prompted in the ECG app. 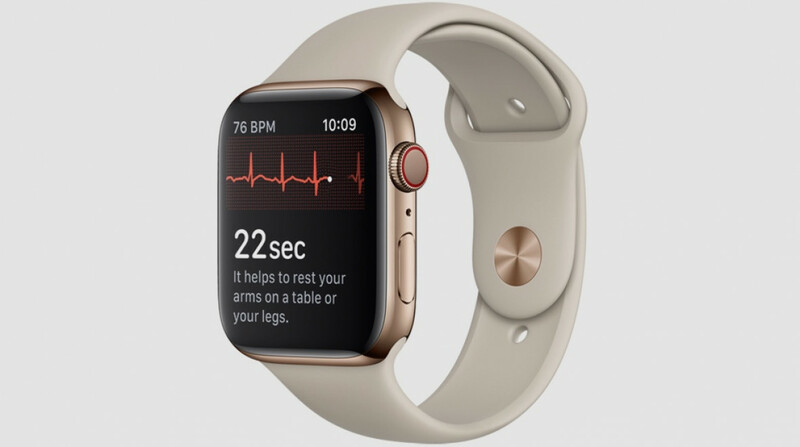 The Apple Watch will then map electrical heart rate patterns over 30 seconds, scoring the heart rate as sinal (normal) or afib (atrial fibrillation) and producing a PDF of the reading in the Apple Health app, which can be shown to your doctor. MacRumours also claims – again via the obtained training documentation – that the 5.1.2 watchOS update will also bring the heart arrhythmia feature to all Apple Watch devices, excluding the original. Series 1 through to Series 4 will have the power to alert users to an irregular heartbeat, detected via the optical monitor. Watch this space for official word.